ISLAMABAD (92 News) – After Prime Minister Nawaz Sharif and Sindh Chief Minister Murad Ali Shah, another Iqama of Defense Minister Khawaj Asif in Dubai surfaced. Khawaja Muhammad Asif has been serving as Minister of Defence and Minister of Water and Power and is reportedly a top contender to be the next prime minister of Pakistan in case the Supreme Court disqualifies PM Nawaz Sharif. 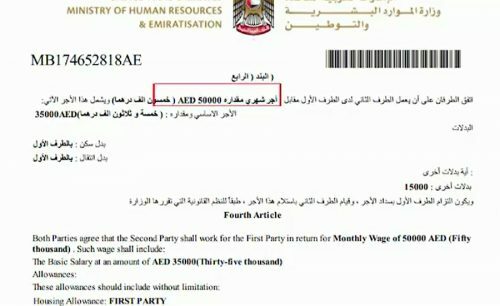 According to the new documents, the defense minister is drawing a monthly salary of AED50, 000 from an Abu Dhabi-based company. 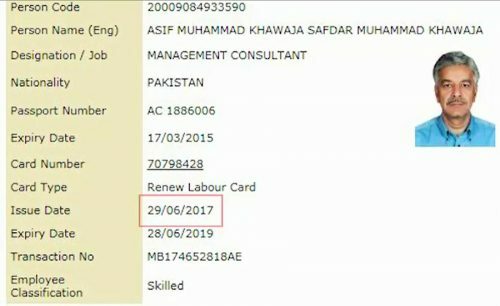 Khawaja Asif’s UAE labor card was renewed on June 29, 2017 and it would remain valid till June 28, 2019. The federal minister did not mention the income he is earning through his employment in Dubai in his nomination papers.